Wayne Avanson is a designer. He is active in Blackburn Drama Club and Accrington Theatre Group as producer, actor and composer. He is involved in the Computer Music scene. He bought his first video camera in October 2007 and this is his first film. 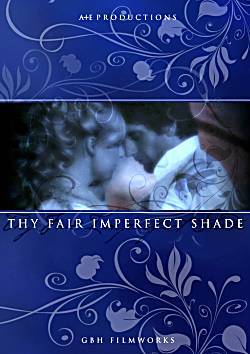 The story of Thy Fair Imperfect Shade came simply through a feeling. Now, as then, it is difficult to explain, which doesn't make for an easy synopsis or logline1, or make it easy to review or judge in competition, but essentially, this love story is about the love that one feels is there, even if it can't quite be reached out and touched. and I felt a creative urge to write these deep emotions into some sort of form that could explore the feelings with sensitivity, with honour and with love.
" which is an instinctive yearning found in many ages and cultures. Upon that premise I would overlay two characters who use their creative energy to pursue the dreams of their love. The setting for the story is symbolic: a huge old room full of the echoes of history and life, dusty with the neglect of ages, dark and dim with the shadows of their emotions. The story is essentially 'written' by the female character in the film. An authoress with such a gift for the language of love that, while wrapped up in her writing, falls in love with the very man whose story she writes, almost inventing her own true love, her soul mate. This man, her character, is a musician, haunted by dreams of his own, as yet unmet, soul mate. He feels that if he can only write the perfect piece of music, the melodies will become a bridge between them and she will release him from his loneliness. But it seems the very dreams he has, are to rob him of his inspiration, and night after night he is lost in tortured silence, feeling only his loss, which is echoed in the loss of his music. As the story is written and develops, she writes his surroundings to be the same as her own, his nights are her shadows and his yearning is hers also. She at last realises that her one true love is buried in the lines that she herself writes, and as she realises, seems to hear the very melody which he must write to make the bridge between them. In the dream sequence, she transports herself to a place with what she feels is his piano, and plays the melody to him as he sleeps. In this, his last dream of her, he 'hears' the melody and is woken with the notes still hanging in the air around him. Then he lifts the melody out of his dream and her with it, until they meet in the final, longed-for embrace. See? Not easy is it? There were, in fact, a couple of other things that didn't make it into the film. The sad ending was cut, where the entire story was yet another dream for both of them, even though it felt so real. The other feature was a connection of flowers which also was cut as it destroyed the flow of the film. The idea being that the flowers in her scarf when it was laid over the piano in the dream sequence, would become a real bunch of flowers lying on the same place on the piano when he awoke. The falling petals during his sleep are the remnant of that idea. The language style was also chosen for its romantic dreamlike qualities. While not exactly Shakespearian, I would say it was definitely influenced by Oscar Wilde's style of language in his rather excellent poetry. Not an easy script to learn I expect, but I was graced by two talented and experienced actors. They took it in their stride and on the day, made me proud with their expertise. After the script was signed-off, I drew the storyboards to match the mood of the piece, relying on slow zooms and rolls in and out of focus to convey the dreaminess and 'otherworldly' feel of the piece. I even scanned in the storyboards and created a short slideshow animation, recording the voices of the two characters to fit with the pictures in order to show the DOP2 the pace of the piece and how it was all to fit together. Music was being composed all through this period. There were two main themes being developed: one for the desolation and loneliness; and one, of course, for the final embrace scene. Along with those were incidental music for transitions and mood. The music was to be both subtle but at the same time underlying and supporting the emotional content of the action. A fine balance to make, which is why, on occasion you will hear only simple, single piano notes, desolate and drowned in reverb, which are intended to emphasise the distance between them. The costumes were to be timeless and slightly theatrical to convey the 'classic romantic' feel. The white dress worn by the leading lady was in fact a 1920's silk wedding dress adorned with long flowing raw silk in a rich gold colour. The location was Samlesbury Hall between Blackburn and Preston, in the Grand Hall. Samlesbury Hall had several charms but also several problems. It was large, could be emptied of extraneous furniture easily, had a bay window and a huge fireplace, creating two distinct areas - one for each character, and of course, a beautiful grand piano. On the downside, even though we filmed late into the evening, the noise from the nearby traffic was to completely ruin our sound work during the shoot. The shoot was originally planned for three evenings: one for her shots; one for his; and one for the joint shots, pickups and cutaways. Unfortunately, our male actor was up against it with work commitments and could only fit in one night for us. In addition, we thought we could have the hall until whenever we finished, but when it came to the shoot, we could only film until midnight at the very latest, which put a great deal of pressure on us to crash through shots at what one could generously describe as, a 'Very Efficient Pace'. So for two evenings at the end of March 2007 from about 5.30 until midnight, people worked with energy and enthusiasm to get through as much as possible - a dedication which was much appreciated. The creative downside to this is that rehearsal with the actors was impossible. The minimum direction was often given as they sat before the camera - and sometimes they were recording a live shot while actually doing the lines for the first time - very impressive. In fact, of the many things I learned during this project, having more than enough time to do what is needed is one of the most important. The other thing learned was that, to compensate for the lack of low light ability in modern video cameras, one should light the subject so that everything can be seen by camera very well, even if your film is to be set at night! One can always darken a shot in software but, as I found in this case, one can't always brighten a shot easily without emphasising the digital noise introduced by the camera working at its full gain setting without enough light to work with. The A+E Team3 consisted of Writer/Director, Production Manager, DOP, Camera assistant, Sound, three Production assistants, Stylist, Lighting, and Clapper-loader4. For post production I had to learn how to use Final Cut Pro on the Mac. Never having done any editing before, it was a slowish process, but I soon got the hang of the fact that the software was a cross between Cubase, the music editing software, and Photoshop, both of which I use on a regular basis in connection with my work as a freelance designer at Avanson Design (01254 814440 plug plug!). From the footage, I had to set about getting the look of the film into how I had originally thought it should appear, nice colours, deep shadows etc. and this took most of the rest of the year, on and off. Not because I was lazy or anything! But just because I was new to it all, and laying some pretty hefty filters and relighting/recolouring work on the job. For the Tech-Heads, the gear used for filming was a Sony A1E, and for editing, Final Cut Studio 2 on a MacBookPro laptop attached to a fast 1 Gig Firewire 800 hard drive. I also have two cheap external monitors which helped no end in the editing. Also I was determined, since it had taken so long to write and prepare, not to rush the job simply to get it out and finished, but to spend time crafting the piece with the intent it had always inspired in me, that is to say to 'feel' the piece developing within its own sense and to touch people who were sensitive enough to feel the same way. During this period I recorded the music, took a couple of sessions from a guest musician and soprano and re-recorded the voices of the actors to lay over our ruined soundtrack. So, what seems like a very long time and a huge amount of work was given to this film and, for a first film, we're pleased with the outcome and reception to it. It might not be as perfect as I would have wished, but we certainly learned a lot of things along the way. The need for more time, more money, more lights, possibly being the top three, but these are things that will be taken much more care of in our second project - Pearl. This will be a much larger project than the last, with a cast of 18 plus re-enactors, and a larger crew of friends from the theatre background. But we will be able to portion this one up into much smaller shoots, and assemble things as we go along so it won't be such a huge pressure. I hope to be able to give an account of the filming of Pearl next year in the same way as I have been allowed to here, with Thy Fair Imperfect Shade. 1 A "logline" is a very short synopsis of a script, no more than a couple of sentences and often in 25 words. Think of the film notes in Radio Times. 2 DOP is Director of Photography - in a small unit usually the cameraman, though there may be a separate camera operator. 4 Clapper Loader is the assistant cameraman responsible for handling and logging all the tape. The name comes from using the clapper-board to give each take a title and loading the camera. Editor's note: we have slightly lightened and sharpened the film images for display here as small pictures on the web. On the big screen the characters emerge from the gloom in soft focus as if approaching through a mist. The effect is mesmerising when combined with the action and music ... but does not translate easily to pictures on a page.